The Fountain Pen has a 21k gold nib with Rhodium plating. Available in medium or broad nib. It’s official! The new Sailor Professional Gear Ocean series is coming to the USA. Following the success of the Professional Gear Sky and Earth, Sailor is introducing its next series - the Professional Gear Ocean. The Professional Gear Ocean has a rich translucent Blue Green hue that perfectly represent the 5 mighty oceans that surround the 7 continents of the world. 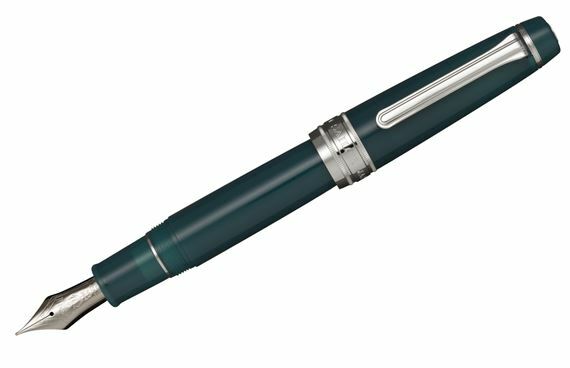 The Professional Gear Ocean in the King of Pen and Standard size feature a 21k gold nib with rhodium plating; the smaller Slim model has a 14k gold nib with rhodium plating. The Sailor Professional Gear Ocean King of Pen fountain pen has a 21k gold nib with rhodium plating and is available in medium or broad point. Cartridge/converter fill.